Convert printable documents to EMF and WMF. Print documents to raster images. Provide a SDK for document conversion. EMF (Enhanced Metafile) is a newer version of graphics file format WMF (Windows Metafile) which is invented by Microsoft. An EMF file can store bitmap and vector image components. Text in EMF can remain vector, and retain the clarity when the image is magnified. EMF format can be used to store original files, and easily processed to other formats. 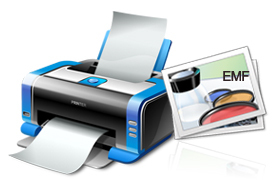 Mini EMF Printer Driver provides a virtual printer for printing any printable document to EMF or WMF files. If the original file is vector, for example, textual, the created EMF file will keep all the vector components. Developer can build and redistribute their software with Mini EMF Printer Driver as a part of it under a developer license. Compatible with Windows 2000, XP, 2003, Vista, 2008, Win8 of both 32 and 64-bit. Command line tool for converting documents. Full control over the output path. Support resolution up to 4800x4800 DPI. Support 1 BPP (bit per pixel, black and white), 4 BPP (16 colors), 8 BPP grayscale (256 gray tones or colors), and 24 BPP color depths. Create EMF, WMF vector files from any application with printing function. Create raster images, such as BMP, JPEG, TIFF, PNG, PNM, TGA, GIF, PCX, etc. Customize paper size and orientation. Easy to install or uninstall the virtual printer. Customize the name of the virtual printer (default as "VeryPDF Demo EMF Printer"). C#, Delphi and Visual Basic examples included in the package. Small size of package (less than 1MB).